1. From the vendor list, select the Add New Vendor button to bring up the add new vendor dialog. 2. You will see a window with boxes labeled as Identity, Vendor Contact Info, Defaults, Website, Account Number, Address, and Contacts. Within these boxes, you will key in the required information into the enabled fields. Label 2. Vendor Contact Info: Key in the contact info for the vendor. If the vendor wishes to be a mailing list subscriber, check the box labeled as Mailing List Subscriber. Label 4. Account Number: Enter the vendor’s account number on the bottom-left corner. Label 5. Address: Enter the vendor’s address. Press the Map button to display a map of the location entered. 3. Enter Purchasing Terms, Return Policy, and Quantity Restrictions if needed. In the Notes box you can type in notes about the vendor. If you check off Add Notes to PO checkbox, the notes will appear on the purchase order screen as well. In the Attributes box, you can key in values for attributes that you have created in the setup menu. 4. 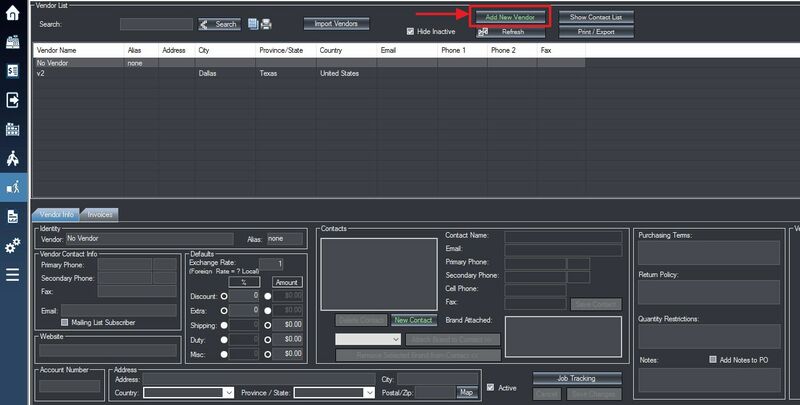 Once you have finished entering in your vendor’s data, select the Save Changes button to save your information.